What it is: Arabian horse known for its speed, endurance and strong bones is one of the oldest breeds dating back 4500 years. The picturesque scene of these horses standing on the Meydan racecourse in Dubai – a racecourse whose grandstand is over a mile in length – is a spectacle in and of itself. Dubai Meydan opens with the zesty, elegant and earthy notes of saffron, lavender and bergamot slowly transitioning into the heart note embellished by the rosy, rich, warm and woodsy notes of geranium, cedarwood and tobacco. The base is dominated by the exotic patchouli and leather. This is an exhilarating fragrance that symbolizes the strength and beauty of the Arabian horse and the high spirit and competency of its riders. About Spirit Of Dubai (SD): An inspiration. Nabeel Perfumes is writing a new chapter in their history of fragrances, and proudly present their luxury fragrance line called The Spirit of Dubai. Inspired by Dubai a city that embraces a wide variety of scenery, captivating contrasts of ancient tradition and the luxuries of a cosmopolitan society. A vision of Hon. Chairman Asghar Adam Ali (Al Attar), the master perfumer, has created 14 fragrances for the brand. The first seven fragrances are a Niche Collection labelled as the First Generation. Where each fragrance in concept, presentation & perfume, represents a different attribute of the City of Dubai from its undulating beaches to its sky-high towers and its reputation as a playground for the rich and famous. The next release of seven fragrances are an Ultra-Niche Collection labelled as the Second Generation. This collection is unique in terms of building upon each of the earlier fragrances keeping in mind the same attributes that drive the thriving metropolis of Dubai – Innovation, World-class Quality, Luxury, Utmost Creativity and Craftsmanship. Each of these 14 fragrances encapsulates’one’ outstanding aspect of the city. Suggested Usage: Spray the perfume by holding at least 5 to 7 inches away from your body. Target the pulse points. The pulse points on your body (where your heart rate can be felt) are the best spots to apply a scent, due to the warmth of your blood. Some such points are located behind your ear, at the bottom of your throat, on your wrist, inside your elbow, and behind your knee. The perfume has a much better chance to lock on to your skin if it is smooth and soft, rather than dry and rough. 100 mL -Grapefruit -Lavender -Artemisia -Cardamom -Cinnamon -Cypress -Saffron -Bergamot -Apple -Nutmeg -Styrax -Tobacco -Kharismal -Cashmeran -Jasmine -Muguet -Geranium -Agarwood -Labdanum -Cedarwood -Cyprus -Oud -Musk -Patchouli -Sandalwood -Leather -Gajak -Vanilla -Tonka -Vetiver -Amber -Benzoin/tolu. These charges are the buyers responsibility. This is so that in case of anything, we can contact you. 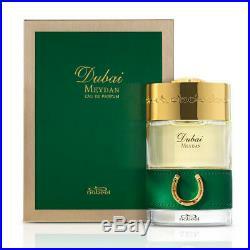 The item “Dubai Meydan Spirit Of Dubai SD 100 mL” is in sale since Tuesday, June 12, 2018. This item is in the category “Health & Beauty\Fragrances\Unisex Fragrances”. The seller is “layali_perfumes” and is located in Abu Dhabi. This item can be shipped worldwide. Posted on April 12, 2019 by admin. This entry was posted in dubai and tagged dubai, meydan, spirit. Bookmark the permalink.